The earliest canals were built by Middle Eastern civilizations primarily to provide water for drinking and for irrigating crops. The Nahrwan Canal, 185 miles (300 kilometers) long, was built around 2400 B.C. between the Tigris and Euphrates Rivers (in present-day Iraq). Egypt's ancient pharaohs linked the Mediterranean and Red Seas with a canal that the Romans later restored and used for shipping. The Chinese were perhaps the greatest canal builders of the ancient world, having linked their major rivers with a series of canals dating back to the third century B.C. Their most impressive project was the famous Grand Canal, begun in the sixth century B.C. and completed in the thirteen century. Stretching for a total length of 1,000 miles (1,600 kilometers), the Grand Canal is the longest canal in the world. 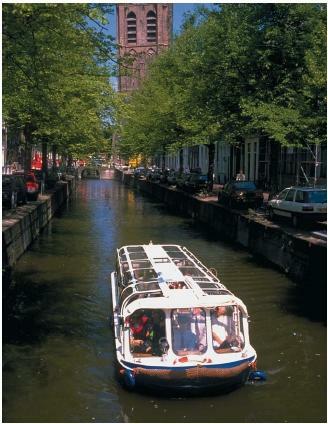 Canal systems for transportation were not widespread in Europe until the seventeenth and eighteenth centuries. The famous Canal du Midi in southern France allowed oceangoing ships to travel 150 miles (240 kilometers) from the Atlantic Ocean to the Mediterranean Sea. The completion of this canal in 1681 spurred the construction of transportation canals in England, Germany, and other European countries. With the onset of the Industrial Revolution in Europe in the eighteenth century, transport by canal soon became essential to the movement of raw materials and manufactured goods throughout Europe. The first major canal in the United States was the Erie Canal. Completed in 1824, the 364-mile (586-kilometer) canal provided a water route that brought grain from the Great Lakes region to New York and the markets of the East. With the coming of the railroads in the 1830s, the United States quickly abandoned its canals, believing that rail was then the best method for shipping and transportation. Today, however, inland canals play a major transportation role in the United States and the rest of the world, since they are perfectly suited for carrying low-value, high-bulk cargoes over long distances. Contour canal: Usually early canals that followed the meandering natural contours of the landscape. Inland canal: An artificial waterway or channel that is cut through land to carry water and is used for transportation. Lock: A compartment in a canal separated from the main stream by watertight gates at each end; as water fills or drains it, boats are raised or lowered from one water level to another. The paths of most canals are affected by variations in the landscape through which they pass. Very early canals followed the lay of the land, simply going around anything in their way. Because of this, they were called contour canals. These canals could not, however, connect two bodies of water that were at different heights. The invention of the lock system in China in the tenth century solved this engineering problem, opening the way for the full development of canals. within the lock is raised or lowered to the level of the water on the outside of the front gate. Valves on the gates control the level of the water. Sea canals, the great canals that shorten sea routes, are engineering achievements. Three outstanding examples are the Suez Canal linking the Mediterranean Sea and the Gulf of Suez (1869), the Kiel Canal connecting the North and Baltic Seas (1895), and the Panama Canal linking the Atlantic and Pacific Oceans (1914). can you please provide me with some books or links helping me to do it?